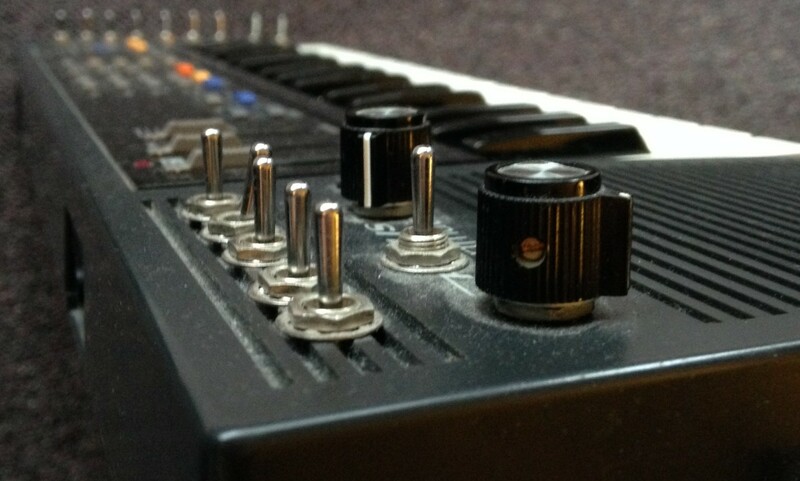 This is a Casio SK-1 keyboard,* originally manufactured in 1986. Those knobs and switches are not stock features: I added them a few years ago with some wire, solder, and a hand drill. This is a process called “circuitbending” and it generally refers to an experimental process of rewiring an electronic device (usually a toy or cheap gizmo) to allow it to produce new sounds… lots of new sounds. Sounds the original engineers hoped would never be heard. To be honest, there are many terrible, awful, grinding and high-pitched whining sounds let loose by circuitbending. But just as suddenly, these tedious sounds relent and I find something momentarily beautiful. That’s what makes circuitbending addicting. In the above example, as the keys swelled and sustained, they also remapped completely in pitch, making it at first very difficult to make a melody. Always keeps you on your toes. So every once in a while I dust this keyboard off and see where it takes me. When I start flipping the switches (the sound of which is also recorded in the audio examples), the instrument gets pretty chaotic. Working with it usually involves a lot of noise–and sometimes I enjoy the noise. But other times I search for something more rhythmic. Usually after 10-20 minutes a cool melody will flutter by, usually brief, and impossible to replicate. Most of the time I am not recording the audio when this happens, but occasionally I am. Below, at about 25 seconds in, a great melody shows up that I can manipulate by flipping some of the switches. Then after about 10 seconds it’s gone. Circuitbent creations are notoriously short-lived and difficult to reproduce. The joy of this instrument for me is exploring a chaotic process and reigning it in just enough to allow moments of beauty to shine through. It is still partly a process of fortuity and chance, but one learns how to become more fortuitous while “practicing” this instrument.